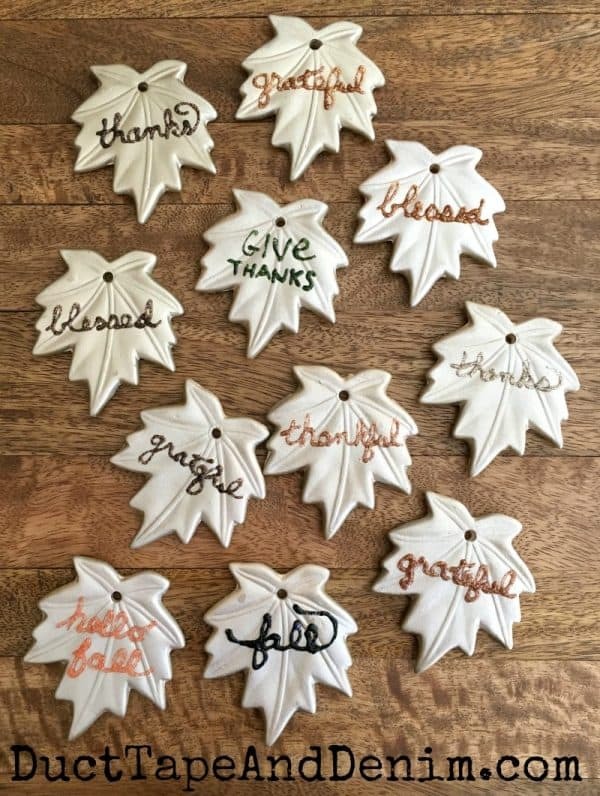 I was looking for some DIY projects to update my “Thanksgiving tree” and recently found just the thing – unfinished DIY ceramic leaf ornaments! These could be finished in any color you want… reds, yellows, and oranges to fit your fall home decor. But I decided to use the metallic spray paint that I used on my junky pumpkins last week and write some words on them to help me remember to be grateful this month. This post contains affiliate links. You won’t pay any more when you use these but I will earn a small commission on any purchases you make after clicking on them and I greatly appreciate it. I was also provided supplies by Oriental Trading. Thanks for helping support my little blog!!! 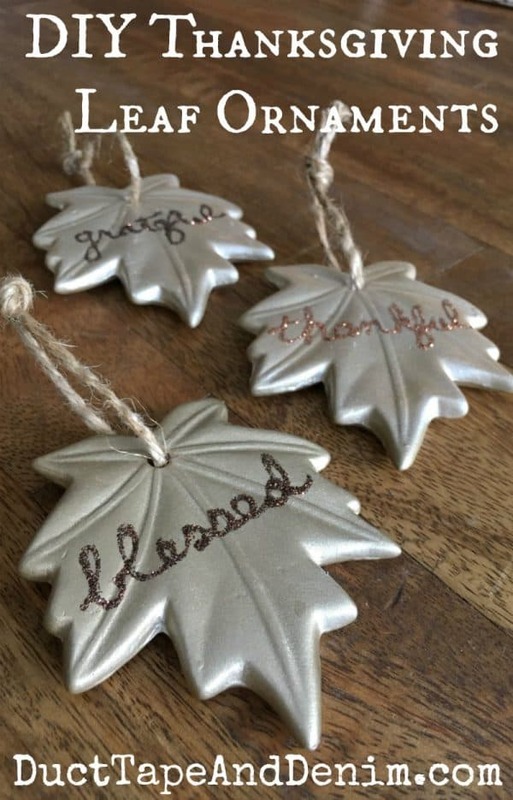 Remove the ribbon hanger from leaf ornaments. 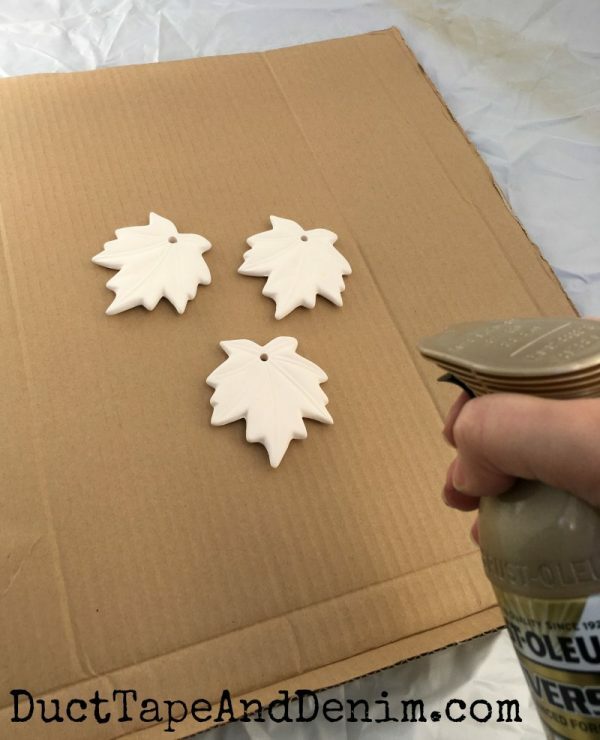 Spray the unfinished ornaments with a couple of light coats on both sides, allowing to dry between coats. Protect your surroundings with a spray shelter and/or a cardboard box. When paint has dried complete, write the words in pencil. Trace words with glitter glue. Allow to dry completely, then tie on pieces of jute. Remember, I keep my small Christmas tree up all year long as a photo prop for all the ornaments I make. So I decorate it for every season. I showed you how to make the paper straw garland last week. 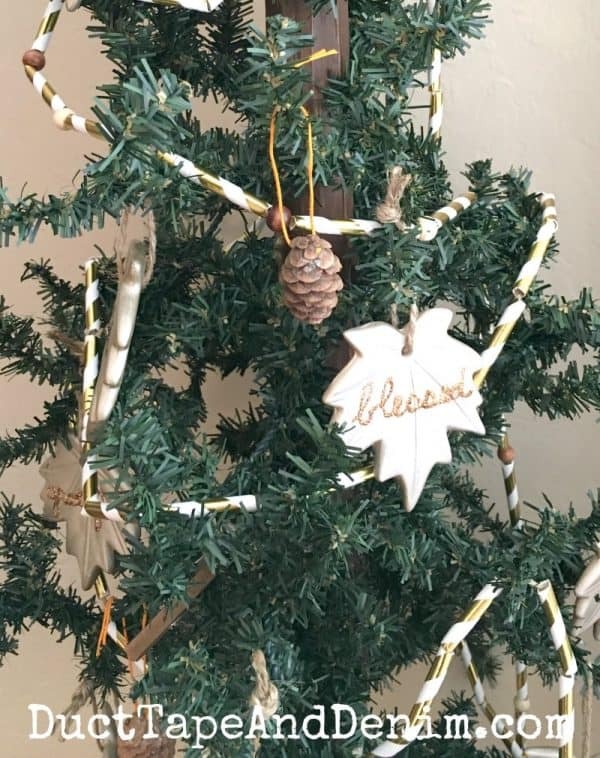 A Thanksgiving Tree from YEARS Ago! Thanks for taking the time out to read my project! I really do appreciate all of you!!! 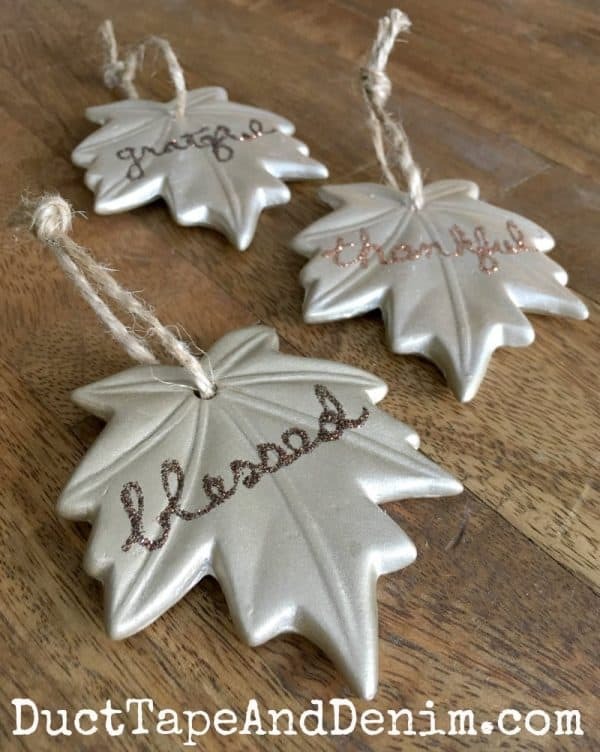 Please leave a comment and let me know if you try making leaf ornaments! Pinterest | Instagram | Facebook | Etsy | YouTube We join these blog parties. Featured on Crafty Weekends. Such a wonderful and heart felt idea and one to teach the little ones what Thanksgiving is truly for. 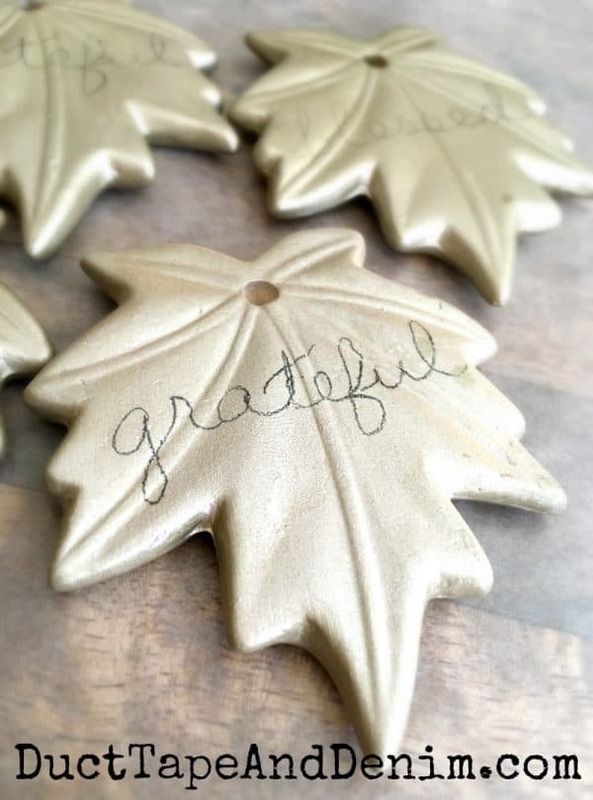 Having those on a tree and introducing them at your Thanksgiving table is wonderful way to teach younger ones what the day is for, gets a good conversation going about what everybody is grateful for. Even little ones can express their gratitude. We have been doing things like this since our 4 kids were young enuf to talk and express themselves, keeps them thinking. Our kids have kept this idea going with their kids and we all hope they’ll keep this going when they have kids. We don’t all live by each other so we talk about it before the holidays. I love this idea. What a neat idea for a fall craft! Thanks for sharing on This is How We Roll link up.